HANTEMP Controls has released capacity data for the Stainless Steel ball valve line of products. WESTMONT, IL – HANTEMP Controls has released bulletin MCBV1117a which includes capacity tables for Stainless Steel MCBV Motor Controlled Ball Valves and manual COBRA-NECK® ball valves. In addition to providing valuable information for engineers, the data clearly illustrates the superior flow characteristics of ball valves. The application examples detail the use of HANTEMP ball valves in industrial refrigeration systems. HANTEMP ball valves provide precise control of refrigerant flow among other advantages. Visit hantempcontrols.com and click on “Technical” to view all of the latest documentation. 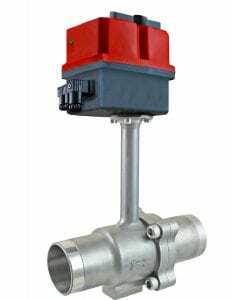 HANTEMP Controls is an established manufacturer of Stainless Steel controlled ball valves, float switches, solenoid valves, pressure regulators and flange unions for industrial refrigeration systems including ammonia, CO2, and others. For more information, please visit www.hantempcontrols.com.